So, we have set a great goal for our health, wellness or even business etc. But sometimes we often get stuck in daily life. I mean it happens right? The dog gets out of the fence, your favorite mug breaks just getting it out of the dishwasher, you stub your toe not once but twice in 5 minutes, and now you are just DONE! Ever been there? Just me!? Oh back to the topic, sorry. Well check out some of the mindset hacks I have used over the years to help me! I hope they help you too! Examples: Fearless, Worthy, Enough, Presence, Positive etc. I like to sit quietly by my favorite Tulip Poplar tree and listen to nature. I just sit quietly and then a word comes to me. I have done this for several years now! It works! I write it down in my planner and even set it as an alarm on my phone too to remind myself to stay on track with my goal. What’s going RIGHT? 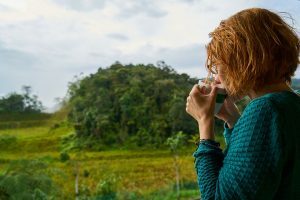 Sit with a cup of tea (I like to sit down with a cup of relaxing herbal tea –grab a free resource below to support you) then write down 3 things that are going WELL or RIGHT for you right now! Even if it is small. I am thankful for ….. I accomplished X. Sometimes we forget how far we have come! Let’s give ourselves credit where credit is due!